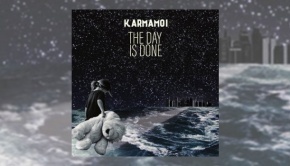 From Italy, Karmamoi present their third album. Two years in the making, changes in the band line-up allowed them to create Silence Between Sounds in a different way to how they worked previously, giving them the opportunity to find new musical paths to demonstrate their personal ideas of what progressive rock is. In the process they have delivered a mature and well crafted album. The band came into being around 2008 as a project for Daniele Giovannoni and Serena Ciacci, being joined later by Fabio Tempesta, Alex Massari and Alessandro Cefali. Their self-titled first album was released in 2011, followed by the Entre Chien et Loup EP in 2012. The second album, Odd Trip, came out during 2013, after which Serena left, followed sometime later by Fabio, the band choosing to continue as a trio. With that in mind they decided to keep the band without a permanent vocalist, opting to use guest singers to bring in their unique styles to enhance the songs, all the time maintaining the essence of their music. They also began to use instruments such as cello, piano, flute and clavinet, and this has gone some way to balance the sound between traditional and modern. Producer and engineer Mark Tucker (Jethro Tull) has been an important part of the project, working closely with Daniele as co-producer and mixing engineer. With a concept that “explores and attempts to understand the reasons behind human failure”, the two years taken to create Silence Between Sounds appear to have been well spent as it is a polished recording, full of atmospheric melody and with a heavier rockier feel at times. There are plenty of twists and turns within the individual songs, the different singers definitely giving a unique life to each whilst sitting well within the music. The album starts with the title track, an almost dreamy piano-led piece which effortlessly segues into Nashira. Here we are introduced to Sara Rinaldi’s smoky, bluesy vocals before the bass lines begin to propel the song forward, the guitar cutting through. The ending of the song has a Bowie-like feel to it, accompanied by a lovely guitar solo. Atma, introduces us to another vocalist, Hellena providing a totally different style. After another piano introduction the bass throb breaks through the melody before the tempo changes as guitar joins in. There’s a beautiful guitar solo from Alex which has a Floydian feel to it. 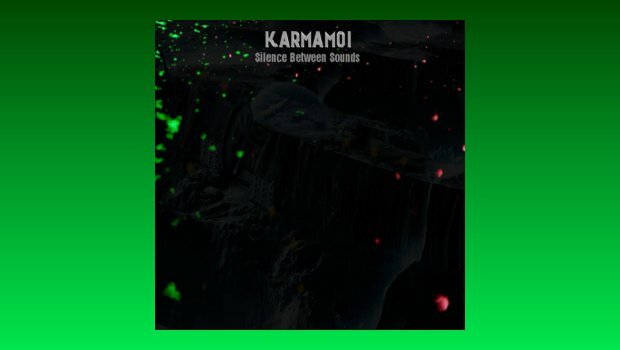 There are influences throughout from the world of prog, pop, rock plus some jazzier elements, but not to the point where Karmamoi directly copy any particular style. They have used their influences to enhance the music; on Plato’s Cave, where Sara returns for the vocals, we get what sounds to me like an occasional Radiohead edge. Lost Days, which is a beautifully melodic song sung by Serena Ciacci, is a piece that Frequency Drift or White Willow would be more than content with. The use of cello and flute is careful and precise, enhancing the songs without dominating them. This is a very good release which offers up an interesting listen, mixing melodic passages with harder edged moments that appear when you least expect them. If this appeals to you then the album is available as a digital download, or as a physical CD direct from the band (via info@karmamoi.it ). Since the release of this album Alessandro Cefali has left, leaving the band as a duo at present, but he will be involved in their upcoming live shows, including at the Winter’s End Festival in Chepstow on 29th April 2018.